SpringFest is April 4th at Hill Auditorium, and tickets are currently on sale! This event is put on by MUSIC Matters, a student-run org who brings big names to campus, like: J. Cole, Migos, 2 Chainz, and Lil Yachty. Every year for the past six years, proceeds from the concert go to several charities. They’ve given over $10,000 to C.S. Mott Children's Hospital and $50,000 to the nation's first "student-for-student" scholarship model. This year, Music Matters has launched a new philanthropic partnership, called CoMMunity Partnership, that works to expand their impact within and beyond campus. Although the evening concert is the capstone event, SpringFest has several attractions taking place throughout the day. 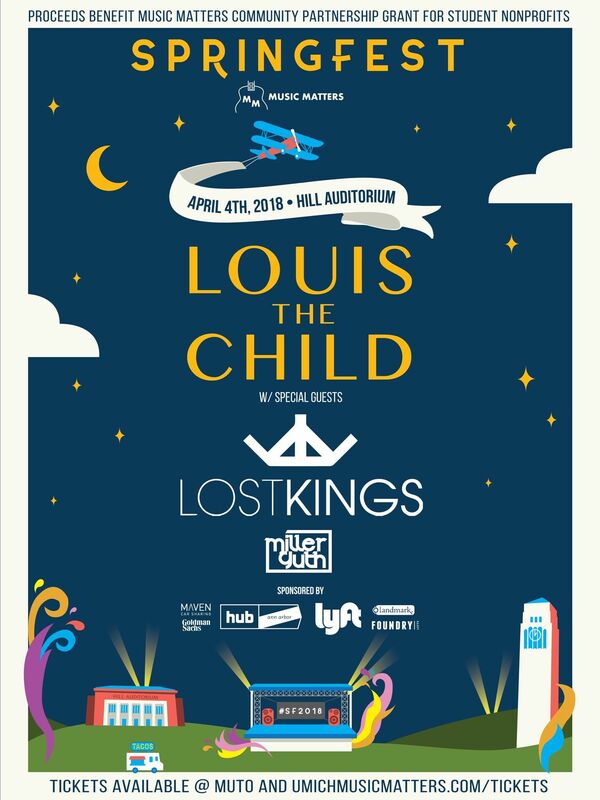 This year, you can catch Louis the Child and Lost Kings as headliners. Louis the Child got their "big break" in 2013, and have been rapidly gaining popularity, collaborating with other big names like Calvin Harris and Zedd for example. And, since 2016, they've played at Coachella, Lollapalooza, and The Governor's Ball, and expanded across borders to perform and headline at festivals in Chile, Argentina, and Brazil. They’ve releasing several hit dance songs, including: "Weekend", "It's Strange", and "Fire". Lost Kings, a duo based in LA, are going on before Louis the Child at the Music Matters event, and they have several #1 hits like "Phone Down" and "Quit You". They've also worked on remixes with Imagine Dragons, Vance Joy, and Halsey. If you haven't already gotten your ticket, prices start at $9.95 based on location, and are available at MUTO and umichmusicmatters.com/tickets. Discounts are available for UM students.